another arctic blast will hit the area this weekend. temperatures will fall into the single digits by late Saturday afternoon, and then plunge to 5 to 10 degrees below zero by daybreak Sunday. 1 to 2 inches of snow Saturday. northwest winds will increase to 15 to 25 mph with gusts up to 40 mph Saturday afternoon, which will cause significant blowing and drifting of snow. Tonight: Snow showers likely, mainly after 4am. Cloudy, with a low around 17. Southwest wind 11 to 16 mph. Chance of precipitation is 60%. Total nighttime snow accumulation of less than one inch possible. Saturday: Snow showers with areas of blowing snow before noon, then snow showers likely with areas of blowing snow between noon and 3pm, then areas of blowing snow and a chance of snow showers after 3pm. Temperature rising to near 20 by 9am, then falling to around 7 during the remainder of the day. Wind chill values as low as -15. Blustery, with a west wind 16 to 25 mph becoming northwest in the afternoon. Winds could gust as high as 41 mph. Chance of precipitation is 100%. New snow accumulation of 1 to 2 inches possible. Saturday Night: Areas of blowing snow and a slight chance of snow showers before 8pm, then areas of blowing snow after 8pm. Cloudy, then gradually becoming partly cloudy, with a low around -8. Wind chill values as low as -30. Blustery, with a northwest wind 16 to 24 mph, with gusts as high as 39 mph. Chance of precipitation is 20%. Sunday: Mostly sunny and cold, with a high near 2. 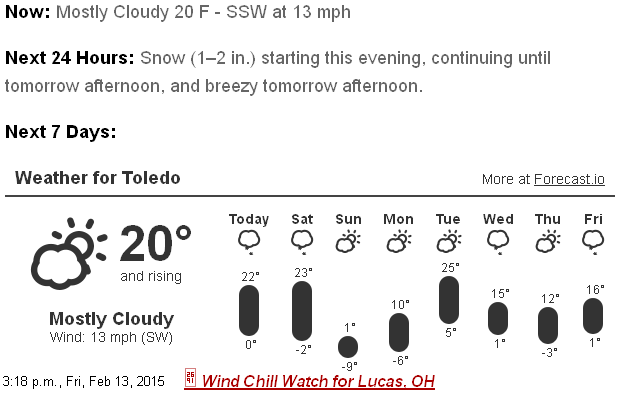 Wind chill values as low as -29. Northwest wind 10 to 14 mph. Sunday Night: Partly cloudy, with a low around -8. North wind 5 to 7 mph becoming calm in the evening. Washington's Birthday: Mostly sunny, with a high near 13.